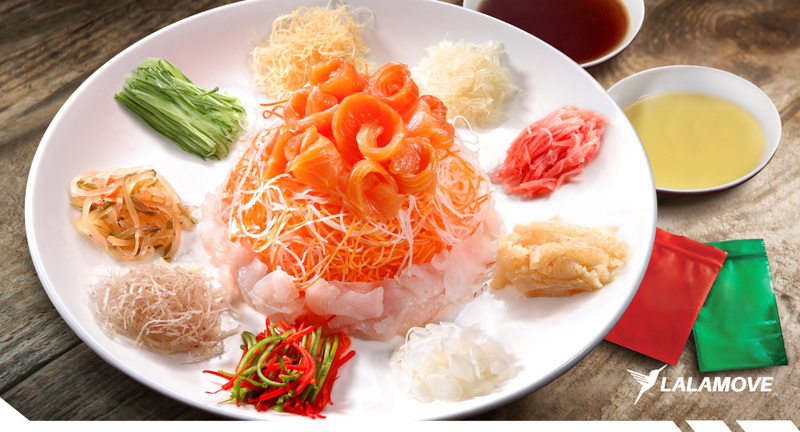 Yusheng Delivery with Prosperous Promocode “LOHSANGLA”! Huat ah! Can’t Chinese New Year come any sooner? We can’t wait to revel in the excitement of this festive season with its bountiful traditions! Thunderous fireworks with such intensity that can trigger car alarms await the ones who are brave enough to lit up the fuses. Dining table with a feast fit for an emperor awaits the jovial and hungry family members who came back from places for the reunion dinner. Another staple of the festive season is none other than the brief cacophony of “Loh Hey!” and other auspicious wishes of good health, fortune, and luck during yusheng-tossing. Never eaten alone, yusheng (or yee sang if you’re into its rich history and semantics) is an exclusively-served appetizer from the first to the 15th day of the Chinese New Year period. Like the colors of its ingredients that come together into one signature dish, yusheng unites all the family members of the household when they mix the ingredients and toss them as high as they can with their chopsticks. The higher you toss, the higher your shot at prosperity for the rest of the year! Fun Fact: Until today, it’s hard to tell for sure whether the yusheng that we enjoy for CNY originated from either Malaysia or Singapore. However, one thing is for sure - our version of yusheng and its pre-feasting ritual are unique to these two neighboring countries! However, since the festive season is getting closer, it is not uncommon for family members to be preoccupied with all sorts of preparations for the new year celebration such as spring cleaning, shopping for new clothes, and baking cookies. Therefore, now is as a good time as any to rely on Lalamove to deliver yusheng to your home! It’s as easy as taking advantage of our Buy4U feature so that we can purchase the yusheng from any restaurant on your behalf and have it delivered to your doorstep! But wait, there’s more ong in store for Lalamove's FIRST-TIME USERS! Don’t forget to apply our CNY-dedicated promo code “LOHSANGLA” to get RM4 off from your yusheng delivery. This promo code is applicable from 25/1/2019 to 19/2/2019 and valid with motorcycle deliveries. We’re also thrilled to support the God of Prosperity’s bidding to spread more huat! Limited edition CNY angpows will be given out during deliveries around this festive season (while stocks last, of course)! Could you be one of our lucky customers? You will know once our deliverer surprises you with the orange packet upon the completion of your delivery. All the more reason to have your yusheng Lalamoved to your doorstep! We wish you a Happy Chinese New Year in advance! Gong Xi Fa Cai, Wan Shi Ru Yi!